A previously unknown binding interface between two key proteins involved in the decision of a cell to survive or die was uncovered at the Rice University-based Center for Theoretical Biological Physics (CTBP). 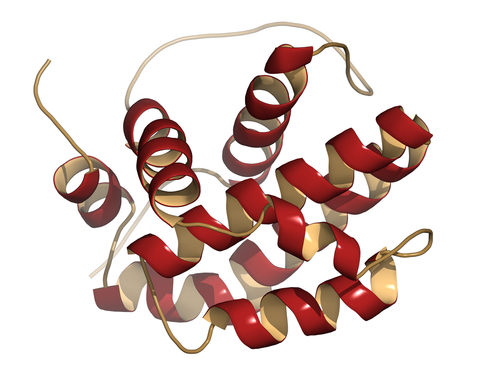 Using computer analysis of experimental data, CTBP researchers found that Bcl-2, a protein involved in apoptosis, and NAF-1, a NEET family protein that binds clusters of iron and sulfur, contain binding pockets and folds that interact. The binding interface can be interrogated for medicinal purposes using medicines that bind either protein, as certain binding sites of the proteins can send a cell toward apoptosis or survival. Knowing which binding site causes what fate is critical for drug design, according to José Onuchic, professor of physics and astronomy at Rice University. The powerful combination of methods led to the discovery that NAF-1 binds to two regions of Bcl-2, and Bcl-2 binds to the NAF-1 groove between the beta cap and iron-sulfur cluster binding domains, which is the heart of the strongest binding domain, meaning that Bcl-2 interaction affects NAF-1 activity. Commented Onuchic, “Others have shown that NAF-1 is up-regulated in cancer cells, which leads us to believe that cancer may hijack control over the expression of this protein. This affects the cell’s system of checks and balances. Understanding NAF-1 gives us a better idea of how to approach treatment.” According to the authors, future targeting of Bcl-2/NAF-1 can regulate apoptosis/autophagy in cancer biology.